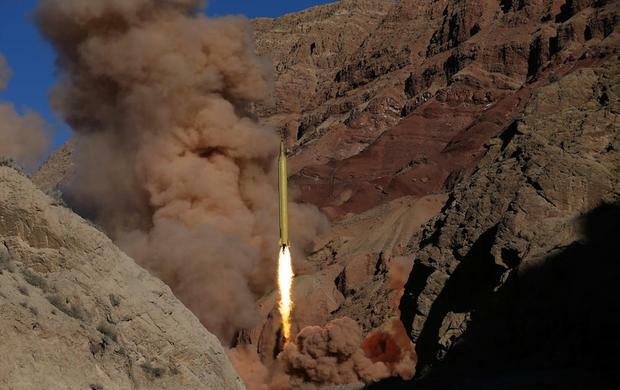 In this photo obtained from the Iranian Fars News Agency, a Qadr H long-range ballistic surface-to-surface missile is fired by Iran's powerful Revolutionary Guard, during a maneuver, in an undisclosed location in Iran, Wednesday, March 9, 2016. Iran’s powerful Revolutionary Guard test-fired two ballistic missiles Wednesday with the phrase "Israel must be wiped out" written on them, a show of deterrence power by the Islamic Republic as U.S. Vice President Joe Biden visited Israel, the semi-official Fars news agency reported. TEHRAN, IRAN (ASSOCIATED PRESS) — Iran reportedly test-fired two ballistic missiles Wednesday with the phrase "Israel must be wiped out" written in Hebrew on them, a show of force by the Islamic Republic as U.S. Vice President Joe Biden visited Israel. Hard-liners in Iran's military have fired rockets and missiles despite U.S. objections since the deal, as well as shown underground missile bases on state television. There was no immediate reaction from Jerusalem, where Biden was meeting with Israeli Prime Minister Benjamin Netanyahu, who strongly opposed the nuclear deal. Biden, speaking next to Netanyahu, did not acknowledge the missile launch directly but he issued a strong warning to the Iranians. "A nuclear-armed Iran is an absolutely unacceptable threat to Israel, to the region and the United States. And I want to reiterate which I know people still doubt here. If in fact they break the deal, we will act," he said. Fars quoted Amir Ali Hajizadeh, the head of the Revolutionary Guard's aerospace division, as saying the test was aimed at showing Israel that Iran could hit it. "The 2,000-kilometer (1,240-mile) range of our missiles is to confront the Zionist regime," Hajizadeh said. "Israel is surrounded by Islamic countries and it will not last long in a war. It will collapse even before being hit by these missiles." Hajizadeh stressed that Iran would not fire the missiles in anger or start a war with Israel. "We will not be the ones who start a war, but we will not be taken by surprise, so we put our facilities somewhere that our enemies cannot destroy them so that we could continue in a long war," he said. In October, Iran successfully test-fired a new guided long-range ballistic surface-to-surface missile. It was the first such test since Iran and world powers reached the landmark deal last summer. U.N. experts said the launch used ballistic missile technology banned under a Security Council resolution. In January, the U.S. imposed new sanctions on individuals and entities linked to the ballistic missile program. Iran also has fired rockets near U.S. warships and flown an unarmed drone over an American aircraft carrier in recent months. In January, Iran seized 10 U.S. sailors in the Gulf when their two riverine command boats headed from Kuwait to Bahrain ended up in Iranian territorial waters after the crews "misnavigated," the U.S. military said. The sailors were taken to a small port facility on Farsi Island, held for about 15 hours and released after U.S. Secretary of State John Kerry spoke several times with Iranian Foreign Minister Mohammad Javad Zarif. Associated Press writers Jon Gambrell in Dubai, United Arab Emirates, Aron Heller and Daniel Estrin in Jerusalem, and Joseph Krauss in Cairo contributed to this report.